Just in case you’re not familiar with the process of letterpress, we wanted to give you an overview of the process and what makes it such an attractive method of printing for your business or next event. The first thing to know is that letterpress is an entirely hands-on process that requires lots of time to print just right. 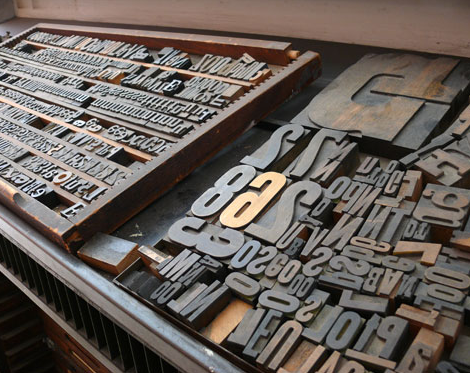 Letterpress originally began with type that had to be set into the press to achieve the layout and design that you want. Printers had cabinets and trays full of type that ranged from signs and symbols to letters from various fonts. You can imagine how limited designs were because if you didn’t have a specific shape, font, etc. in your inventory, then you couldn’t letterpress the design. Here’s a picture of the old type that was used. Letterpress printing has since evolved into a medium that somewhat bonds digital technology with the old way of letterpress printing to produce the amazing pieces you see today. We now take digital vector files (illustrator AI & EPS files) and produce photopolymer plates. These plates are then mounted to a base and loaded into the letterpress. This plate is then inked and stamped directly into paper to transfer the ink and impression. This impression is what gives letterpress it’s unique 3D like feel. You end of with a letterpress printing process that can print anything that can be made digitally. See a plate below. When we letterpress, each color in the design is represented by one of these plates. In theory, you can produce a lot of colors, but these plates are a big part of the letterpress expense & time. Everytime we change colors, we need a new plate and the machine has to be configured to run that new color. Let’s just say a 4 color design can become quite the affair. Traditional letterpress machines were made from the 1400′s through about the mid 1900′s. They’re big cast iron machines that just need a little love to make them work ;) They were moved out of production because new machinery (process printing) can do 5-10 times the work in the same time frame, but by sacrificing quality, texture, and authenticity. If you want perfect prints and want 500 pieces to match EXACTLY, then letterpress is not for you. 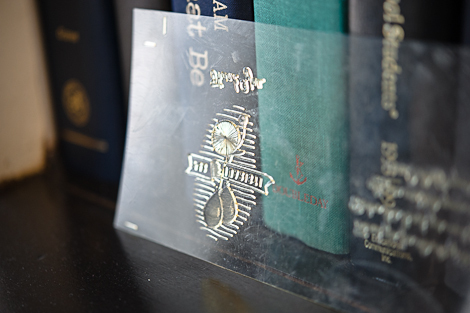 Letterpress has variations from piece to piece because of the manual nature of letterpress printing.